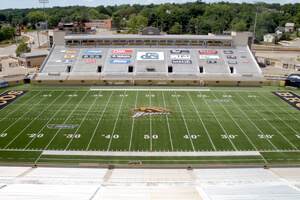 Due to the extreme heat expected in Michigan for the next few days, for the safety of the spectators and the performers, Drum Corps International will delay the start of the DCI Kalamazoo event scheduled for Saturday, July 7 at Western Michigan University. The event will now begin at 8 p.m. (ET). "By delaying the start, we're anticipating that we'll be able to escape some of the heat as the sun goes down, keeping the welfare and safety of our corps members in mind while also ensuring that spectators will be able to enjoy their outstanding performances in greater comfort," DCI Director of Events Susan Kuehnhold said. The revised schedule for DCI Kalamazoo is as follows: 5:30 PM - Kick Start Your Season Leadership Workshop (in Read Fieldhouse) 6:00 PM - Stadium Gates Open 6:30 PM - Super Premium Ticket Holder Dinner 8:05 PM - Welcome and National Anthem 8:17 PM Racine Scouts 8:34 PM Legends 8:51 PM Pioneer 9:08 PM Glassmen 9:25 PM Intermission 9:42 PM Spirit of Atlanta 9:59 PM Madison Scouts 10:16 PM Blue Stars 10:33 PM Bluecoats 10:50 PM The Cavaliers 11:07 PM - Encore 11:25 PM - Awards Ceremony Times subject to change. View additional DCI Kalamazoo event details.